Past life memory through spiritual exercise. The possibility of multipal lifetimes was presented through Buddahism, where Buddah himself was believed to be within the system of re-birth through his choice. Where the meaning of multipal lifetimes is to learn, to become fully human, through many differing lives, places and spaces of existence. The lesson finally is of joining in creation through conscious thought, and also as an active participant in the state of compassion. As a teen, I read of an exercise that could be done without assistance. When using the practice, I came to the realization, that in a past life I was of extreme poverty. I lived in the Middle East and was a part of Islam. I was a women with several children, all things I sensed as I was taken into a past truth. I was given an actual visual of where I was during that lifetime. The exercise is this, find a darkened space, sit or lie down where you are comfortable. Empty your mind of all thought, then invision a door. When you have the image, will it to open and wait for what appears to you. Mine was very clear, and afterward I understood something which is a part of me, and is still within me. In this lifetime I was born and live upon the American continent, raised as a Christian in childhood. I came to understand, that through the differing god-dominant religions of absolutism and dictate, that they were more of seperation than unity. The faith based systems I have embraced came from that conflict, which continues today. 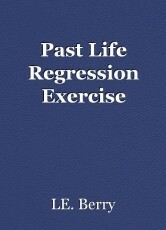 Through the regression exercise, I understood that about myself, adding to the knowledge of where we come from.